River of Kings Bike Tour - Experience Old World Thailand on this Cultural Bike Tour! The River of Kings Ride through Thailand exposes you to the kingdom’s ancient history and colourful culture. From Chiang Mai, the capital of north Thailand, we cycle through the Chao Phraya River valley where Thai civilisation began and visit the ancient cities of Lampang, Sukhothai, Khampeng Phet, and Ayutthaya. The route follows quiet backroads where you will be amazed at how little traffic is encountered. Cycling takes you off the beaten track to the lesser known towns of Pa Mok and Uthai Thani, where you will definitely find the “land of smiles." The scenery is ever changing as it starts in the mountainous north, then continues through the emerald paddy fields of the central rice belt and then to the rugged jungles of Kanchanaburi before arriving in the vibrant metropolis of Bangkok. The River of Kings Ride takes you back in time, far from the busy streets and fast-paced modern city to a period of more than 700 years ago. It’s a tour where you can lose yourself in old world ruins and history, thereby experiencing the culture of this truly mesmerising country. Meet for a welcome dinner at a restaurant overlooking the Ping River. Explore the ancient and modern city of Chiang Mai and drive up Doi Suthep to Wat Phra Thad Doi Suthep (AD 1384), the most sacred temple in North Thailand, to take in a panoramic view of the city. We ride south along the Ping River to the ancient city of Lamphun for lunch, stop for a visit to Wat Phra That Hariphunchai, and transfer to Lampang -- the Cowboy Town. Ride on country roads through local villages, with time to stroll through markets or stop at one of the many temples we pass. We climb a few hills to the Mysterious Rock Garden. We head off the beaten track as we wind towards Sri Satchanalai Historical Park and transfer to our hotel in the first capital of Thailand, Sukhothai. Enjoy a day of riding around the UNESCO World Heritage Site of Sukhothai to see some of the 193 ruins. Cycle at a leisurely pace so you can capture some of the stunning Buddha statues. Cycle on pleasant country roads to Khampeng Phet, a fortress city used to help defend Sukhothai from invading armies. You'll quickly understand why Thailand is the top exporter of rice when you see the many paddies on the way to Uthai Thani. Lunch on a charming restored rice barge while you cruise on the Sakaekrang River. Ride the forested island of Thepho, where the Chao Phraya River and Sakaekrung Rivers meet, cycle to Chai Nat for lunch and visit the Wat Pa Mok's reclining Buddha in Ang Thong, before Ayutthaya. Cycle south to Bang Pa-In to visit the summer palace of King Rama V and then transfer to Kanchanaburi, stopping to visit the Bridge over the River Kwai before heading to our jungle resort on the riverside. Follow the River Kwai along a mixture of jeep trails, tarmac and quiet backroads to the city of Kanchanaburi. fWe visit the famous floating market in Ratchaburi and then start our bicycle ride following canal paths and small backroads. We transfer to Bangkok and go for a pleasurable ride in Bang Kra Jao. Our farewell dinner will be a river cruise on a converted rice barge along the Chao Praya River. Free day last day of tour. Day 3 - Chiang Mai - Lampang Ride 50km. +316m / -206m. Recently we completed the 'River of Kings Ride' which was our fifth tour with SpiceRoads. It was an awesome way to discover the variety of highlights available as we rode From Chiang Mai to Bangkok. Our guide and driver were courteous and supportive. The River of Kings Ride is the longest tour we've done with SpiceRoads. The number of days that it is spread over ensured that we could explore the variety of activities in a timely manner. It was an exciting experience for my husband and I. Well done! Our third tour with you was an excellent one for people our age (between 71 and 74). We are impressed by the professionalism of the guide and the driver and both of them were very sympathetic. Great combination of history, local culture and the best Thai food. The guide, He was always very cheerful, polite and informative. He kept us well informed about what to expect each day Always happy and smiling! The scenery is ever changing as it starts in the mountainous north, then continues through the emerald paddy fields of the central rice belt and then to the rugged jungles of Kanchanaburi before arriving in the vibrant metropolis of Bangkok. We ride 530 km in 11 days of riding, but this tour is mainly on road, so the distances are not too strenuous. We designed the route for those who wish to see the rural Thai countryside and the rich history of Thailand, all while enjoying an active holiday. We have a few climbs on the first two days as we cross the hills surrounding Chiang Mai. The central part of Thailand is flat, and after the third day, we do not see many more hills of significance. Biking Conditions: This trip is mainly on tarmac roads with a few days where we will have hard packed dirt trails – no off-road experience required. An air-conditioned bus travels behind the group to support us, and participants can cycle as much or as little as they like and still enjoy the same views as the rest of the group. Arrive in Chiang Mai and transfer to the hotel. Check-in and have leisure time. In the evening, we enjoy a delicious welcome dinner at a restaurant overlooking the Ping River. After breakfast, we explore the ancient and modern city of Chiang Mai, including its old city walls, gates and moat, markets, residential areas, and Tapae, Chiang Mai´s main street. We continue our tour with a drive up Doi Suthep to Wat Phra Thad Doi Suthep (AD 1384), the most sacred temple in Northern Thailand. Inside the cloister of the temple, you will see one of the most sacred stupas in all of Thailand. A panoramic view of the city can be seen from here at 3,500 ft above sea level. Then visit Wat Jed Yord (AD 1455), featuring a seven-spired stupa and Wat Suan Dok, where the ashes of Chiang Mai´s royal family are interred. Dinner is your choice tonight; our guides have a list of recommendations. We ride south of Chiang Mai following a scenic route along the Ping River and eventually arrive at the ancient city of Lamphun in time for lunch. Afterwards, we visit Wat Phra That Hariphunchai, built around 1044 AD, and one of the finest examples of ancient Lanna temple architecture, before transferring to Lampang. Dinner is at a delightful riverside restaurant. After our short transfer into the hills of Maerang, we ride on small country roads over small quaint bridges and through small local villages. You’ll also be able to get off your bike and stroll through the many colourful markets found on today’s tour. Stopping at one of the many temples we pass is also encouraged, and you might be intrigued by the town of Ban Nasan, noted for its bamboo products. We have a few hills to climb before we reach the Mysterious Rock Garden, and then it’s downhill all the way into the historic town of Phrae. Transfer to Uttaradit. We really head off the beaten track today, as we ride on some of the most secluded and beautiful roads in Thailand with a canopy of palm trees providing some natural protection from the hot Thai sun. We pass lush green paddy fields and many villages as we head towards the first capital of Thailand, Sukhothai. 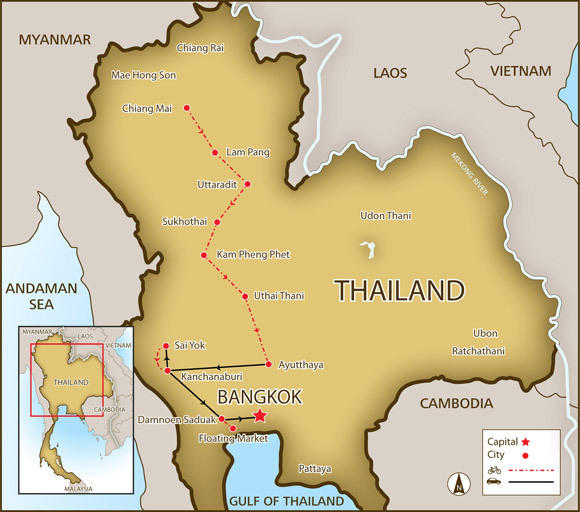 The 13th-century reign is generally viewed as the “golden age” of Siam due to the fact that its influence spread as far west as Burma, east as far as Cambodia, and south down into Malaysia. Ride to Sri Satchanali Historical Park. Transfer to hotel. We have dinner at the excellent Dream Café, surrounded by artefacts and antiques. A day to enjoy the original capital of Thailand by taking a ride around the historic park. A UNESCO World Heritage Site, there are more than 193 ruins surrounded by three moats and bridged by four gateways. Bikes are the best way to enjoy this ancient city, and you won’t want to forget your camera to capture some of the stunning Buddha statues. Or simply have a day off the bike and enjoy the town of Sukhothai. 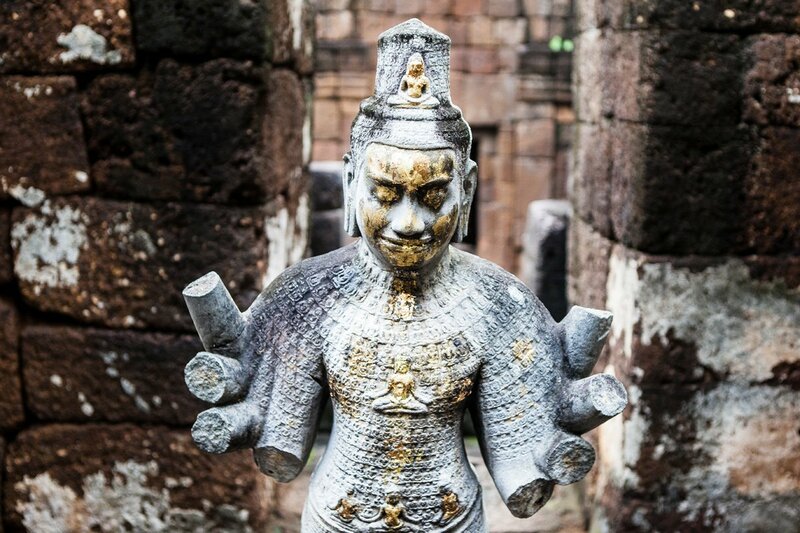 Khampeng Phet, also known as the “Diamond Walled City,” was a military fortress used to help defend Sukhothai from invading armies. The moss and flower covered ruins give it a quality not seen in its more popular and restored neighbour of Sukhothai. We have plenty of time to visit the sites by foot or by bicycle. The ride to Khampeng Phet is on pleasant country roads with plenty of activity going on all around to keep your attention. Transfer in the morning before enjoying a leisurely ride along scenic roads to Uthai Thani. You’ll quickly understand why Thailand is the top exporter of rice when you see the many paddies on your route today. Look out for water buffaloes wallowing in a puddle and for ducks taking a dip in a rice field. Arrive in Uthai Thani in time for lunch on a charming restored rice barge while you cruise on the Sakaekrang River. Relax as the river banks offer up glimpses into traditional Thai-style of living – from men fishing to women doing laundry to children playing. After breakfast, it's time to get on the bike for a ride on Thepho Island, named after a fish abundant in the area. This forested island is noted for its attractive lush greenery and is where the Chao Phraya and Sakaekrung Rivers meet. We cross the river several times by ferry, passing by orchards and rice fields, and ride along the shady banks of the Chao Phraya River, finally arriving in Chai Nat in time for lunch. In the afternoon, we transfer to Wat Pa Mok, where we visit a reclining Buddha before arriving in Ayutthaya. If you still have the energy, enjoy a late afternoon ride around the historic park. We ride south to Bang Pa-In to visit the Summer Palace of King Rama V, or King Chulalongkorn, who regularly spent his summers there. The structures represent a variety of architectural styles, from very old Chinese handicrafts to 19th-century European ornaments and furniture. All of them set in a large park around ponds and waterways. After a local lunch, transfer by van to Kanchanaburi, stopping to visit the Bridge over the River Kwai. Arrive at your jungle resort in the evening. We follow the River Kwai, riding through jungle, between farmer’s fields, along a mixture of jeep trails, tarmac, and quiet backroads to the town of Kanchanaburi. We stop for lunch at a local restaurant on the way. In the morning, we depart by bus to Damnoen Saduak and visit the famous floating market. We then start our bicycle ride following canal paths and small backroads where you’ll see temples and fruit orchards varying from lychees to pomelos and guavas to coconuts ripe for picking. We transfer to Bangkok and then take a ride in the green part of Bangkok called Bang Kra Jao, where you'll feel surprisingly removed from the bustling city just on the other side of the river. Our farewell dinner will be a river cruise on a converted rice barge on the Chao Praya River – what better way to end The River of Kings tour. Free time until your airport transfer for your onward flight. Because some people can't imagine going on a trip without their own beloved bicycle, we do not provide them as part of this tour. However, you can hire bikes locally for the price listed in the tour pricing section. The bikes are well-known makes of hybrid bikes with lightweight alloy frames, 24- to 27-speed gearing, v-brakes, and Shimano components. If you bring your own bike, please make sure it is a mountain bike, preferably with front suspension, in good mechanical order.